From the prizewinning author of What Is Not Yours Is Not Yours and 2019's Gingerbread, comes a brilliant recasting of the Snow White fairy tale as a story of family secrets, race, beauty, and vanity. In the winter of 1953, Boy Novak arrives by chance in a small town in Massachusetts looking, she believes, for beauty—the opposite of the life she’s left behind in New York. She marries Arturo Whitman, a local widower, and becomes stepmother to his winsome daughter, Snow. A wicked stepmother is a creature Boy never imagined she’d become, but elements of the familiar tale of aesthetic obsession begin to play themselves out when the birth of Boy’s daughter, Bird, who is dark-skinned, exposes the Whitmans as light-skinned African-Americans passing for white. 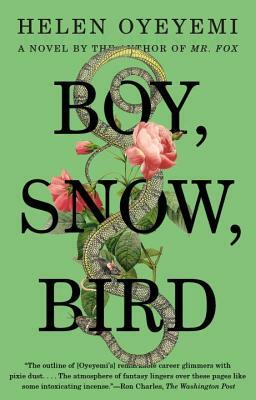 And even as Boy, Snow, and Bird are divided, their estrangement is complicated by an insistent curiosity about one another. In seeking an understanding that is separate from the image each presents to the world, Boy, Snow, and Bird confront the tyranny of the mirror to ask how much power surfaces really hold. Helen Oyeyemi is the author of five novels, most recently White Is for Witching, which won a 2010 Somerset Maugham Award, Mr. Fox, which won a 2012 Hurston/Wright Legacy Award, and Boy, Snow, Bird. In 2013, she was named one of Granta’s Best Young British Novelists. She lives in Prague. "This imaginative novel explores identity, race and family, arguing in brilliant language that black, white, good, evil, beauty and monstrosity are different sides of a single, awesome truth."